In contract manufacturing, removing excess material that remains on a metal part after fabrication is an important finishing step. Despite utilizing increasingly sophisticated machining centers, however, much of the secondary finishing work is still performed by hand using oscillating tools, grinders, files, abrasive hand pads, and wire brushes. This labor-intensive approach only serves to drive up costs– for both the shop and, ultimately, the customer– while yielding inconsistent results. For those parts that do not meet the specifications, reworking may also be required. As a result, contract manufacturers are turning to new finishing tools that can be easily integrated into automated machinery, CNC machines, transfer lines, or robotic cells in an effort to rein in costs and achieve more consistent results. These new options include abrasive nylon brushes that can be used for a variety of finishing operations, including deburring, edge breaking, surface finishing, and even light corrosion removal. In some cases, these multi-purpose tools can also eliminate machining operations traditionally performed by chamfer tools and face mills. 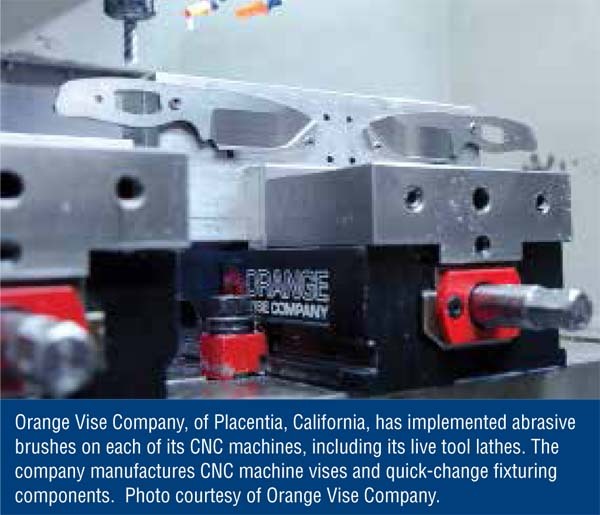 "We have implemented abrasive brushes on every CNC machine we have, which includes our live tool lathes," says Eric Sun, founder of Orange Vise Company, located in Placentia, California. In addition to manufacturing CNC machine vises and quick change fixturing components, Orange Vise also performs a significant amount of contract manufacturing. The disc brushes that Sun utilizes are from the NamPower line developed by Brush Research Manufacturing. Composed of flexible abrasive nylon filaments bonded to a fiber reinforced thermoplastic base, the abrasive disc brushes contain a unique combination of both ceramic and silicon carbide abrasive. 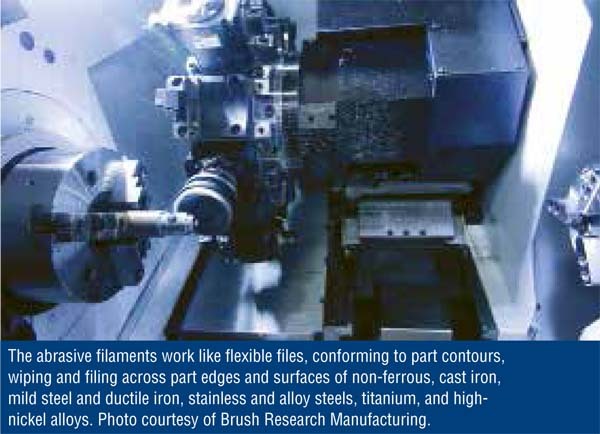 The abrasive filaments work like flexible files, conforming to part contours, wiping and filing across part edges and surfaces of non-ferrous, cast iron, mild steel and ductile iron, stainless and alloy steels, titanium, and high nickel alloys. "For us, there really isn't another solution, because the alternative is to have a worker use a file or a handheld abrasive pad, and the part is not going to have the finish you get with the abrasive nylon brushes," says Sun. Finishing sharp edges between two faces of a part, as well as deburring bits of metal or imperfections caused by the cutting action of the tools, can be accomplished with a variety of techniques. Hand finishing is an option, as are options such as tumbling. Chamfering tools are also frequently used to provide a transitional edge at 90 degree angles, as well as for deburring. For some contract manufacturers, however, eliminating the chamfering step can prove valuable. For Ken Spaulding of Zodiac Engineering, a contract manufacturer in California with a background in aerospace parts, as well as mold making, he typically uses a 90 degree, solid carbide chamfer tool to break edges that are easy to reach or must be a specific size or angle. However, whenever he needs to quickly deburr parts, he runs the NamPower brushes over them. "I run the abrasive nylon brushes over any fairly flat part I have going in the mill," says. "I don't want to use a chamfer tool for edge breaking or deburring if it's not necessary." The majority of the machining work Spaulding currently focuses on includes pocket knives, as well as cycling components for BMX, road, and mountain bikes. Spaulding sells products of his own design, along with contract manufacturing. Spaulding first became familiar with Brush Research in 2004, when he first started using their Flex-Hone products. He was later introduced to the NamPower abrasive discs by watching several videos produced by another machinist in the area that showed them in use. Shortly after that, he did an initial trial on the 60mm tool and was quickly convinced it worked well to clean up shallow 3D machined surfaces and smooth out feedlines on the knife blades he manufactures. Today, Spaulding uses the NamPower abrasive discs on his CNC and manual milling equipment for light deburring, as well as surface finishing of various types of metals and alloys. For the pocketknives, this includes stainless steel for the blades; titanium and zirconium for the frames and handles; 6061 aluminum for the bike stems; and 7000 series aluminum for the sprockets. "With the brushes, I get a very predictable and consistent edge break and surface finish," says Spaulding. "I can do it in-line, and it is a lot more predictable and reliable than breaking edges by hand." For the cycle sprockets he produces, for example, Spaulding runs the brushes over the teeth in a single pass on each side of the part. "The brushes deburr pretty much every side of the tooth, so I don't have to run a chamfer tool around the edges. Also, tumbling doesn't really get inside the teeth, like the brush does," explains Spaulding. Over time, he says he has added additional diameters and grits of the NamPower abrasive discs to his tool library. Spaulding also appreciates the longevity of the NamPower brushes. The brushes are essentially "self-sharpening" over their life. Because of its linear construction, sharp new grains constantly come in contact with the work surface and wear off, exposing fresh cutting particles. This provides consistent deburring action throughout the length of bristles. "The NamPower brushes seem to last forever," explains Spaulding. "As the brushes wear, they continue to stay sharp as the bristles fracture and expose new abrasive. When the chamfer tools wear out, they either need to be reground or replaced entirely." Even when chamfer tools are specified, the edges may still require deburring. "Chamfering tools are just half of the puzzle," says Sun of Orange Vise. "The other half is some sort of abrasive method, such as tumbling. However, tumbling can be impractical for larger parts or anything that needs to remain dimensionally unaffected." Instead, Sun finds abrasive nylon brushes "complementary" to 45 degree chamfering tools. This extends to chamfered holes, he said. "Often chamfers leave burrs on the top and the inside edges of drilled holes, so we use the NamPower brushes because they are flexible enough to remove any burrs from the top edge, while going into the hole enough to deburr the lower edge," says Sun. Minor edge breaking is another potential use for the abrasive nylon brush, according to the manufacturer. Although most manufacturers specify the degree of edge finishing, there can be gray areas where a customer may not want a sharp 90 degree edge, but does not specify chamfering. In cases like this, Orange Vise may slightly round off the edges and corners with an abrasive nylon brush. The rounding can be minimal, if necessary, so it is not visible to the naked eye. In addition to edge finishing, the abrasive nylon brush has application for surface finishing. In some cases, this can replace the use more aggressive face mills, flycutters, or grinders. Sun describes the finish as "almost like a milled finish, with a consistent swirl pattern in one direction." "The surface finish was good enough that we were actually blending it with our ground finishes on our vices," says Sun. "With large surfaces that required multiple passes, there were no visible blends. The whole thing looked like it was done in one pass." He adds that there are times when a workpiece, or even a machine, does not lend itself well to using a large face mill, creating the need for multiples passes to accomplish the task. "You can use a brush to create a cosmetic 6-inch pattern even if the machine can't handle a similarly sized face mill," says Sun. Another potential use for the tools is light corrosion removal, often without affecting specified tolerances. "With only a few passes of a 120 or 180-grit brush, you can remove a significant amount of rust without affecting the dimensions of the workpiece," says Sun. "On steel, for example, it is unlikely to create a measurable difference. The pattern will be nice and even, as opposed to if you use a handheld abrasive hand pad, where the patterns may run in random directions." Sun cautions that aluminum is more susceptible to dimensional changes when using abrasives, so a finer grit brush may be required. However, the removal of material is minimal– measured in ten thousandths of an inch– so if the tolerances are within a fairly typical 2-3 thousandths of an inch, it would not be an issue. According to Spaulding of Zodiac Engineering (www.zodiaceng.com), the brushes are available in a variety of options, including two fill configurations: the Dot Style, for general purpose deburring and surface finishing, and the Turbine Style, which has a higher-density fill for more aggressively deburring. Sizes include 100mm, 125mm, and 150mm diameters at trim lengths of 18mm or 38mm. Available grits include 80, 120, 180 and 320. "With the different grits, diameters, and trim lengths, the abrasive nylon brushes are extremely versatile as long as you have a few different sizes and styles," says Spaulding, who primarily uses the Dot Style. "Without question, the [NamPower brushes] have paid for themselves." Jeff Elliott is a Torrance, California-based technical writer who has written about industrial technologies and issues for the past 20 years.